Researchers with the University of Newcastle’s Coal River Working Party are one step closer today to zeroing in on a buried relic laid almost two centuries ago by Governor Lachlan Macquarie, affectionately known as the ‘Father of Australia‘. The Foundation Stone to Macquarie Pier, aka The Newcastle Breakwater, was laid on a Wednesday the 5th August 1818 at 4pm in a ceremony on the shores beneath present day Fort Scratchley. Over the centuries the original foundations to this Colonial era relic were sidelined, buried and forgotten. The fate of the original foundations now lost to the world. During the Macquarie 2010 celebrations, celebrating the period of Lachlan Macquarie’s term as Governor of New South Wales, the University of Newcastle began a quest, on behalf of the people of Newcastle and the Nation, to find the original beginnings of the Macquarie Pier. A commemorative dedication plaque was designed by Auchmuty Library designer Danylo Motyka, and financed by the Institution of Surveyors (Hunter manning Group) and Emeritus Professor John Fryer, and was unveiled and laid in the walkway near the site, by Her Excellency Professor Marie Bashir AC CVO, Governor of New South Wales. 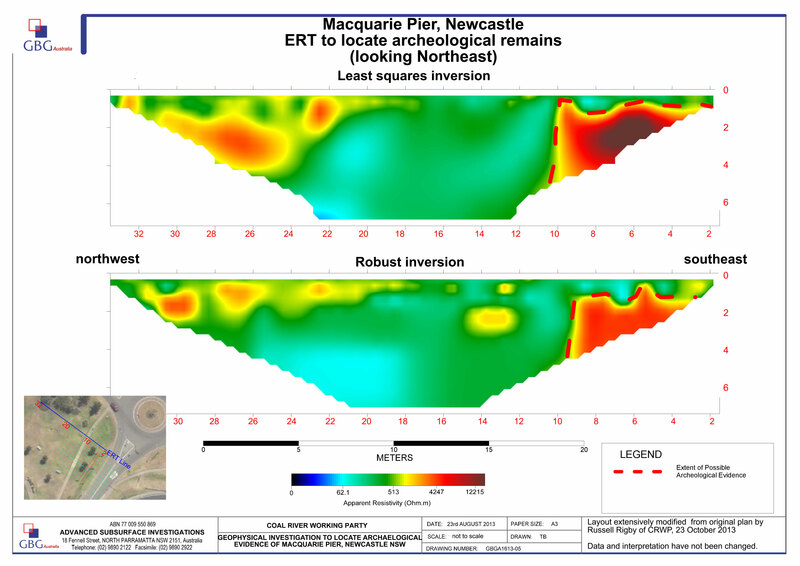 The New South Wales Government provided a modest grant to assist, and on the 13th August 2013, geophysicists from GBG Australia began a subsurface investigation using ground penetrating radar (GPR) and electrical resistivity tomography (ERT) to locate the buried structure. The draft results have provided some hope. While the ground penetrating radar (GPR) results proved inconclusive and disappointing, the electrical resistivity tomography (ERT) found evidence of a structure of possible human construction around 1 metre below the surface. “The problem with these investigations is that, on the day, it was like they were using two old film ‘cameras’, where you would take the photographs, then send the film off to processing to see whether they had come out,” said University’s Coal River Working Party Chair, Gionni Di Gravio, “when the photographs came back we should have shot more using the ERT ‘camera’, since it was the one that captured the better shot!” he said. 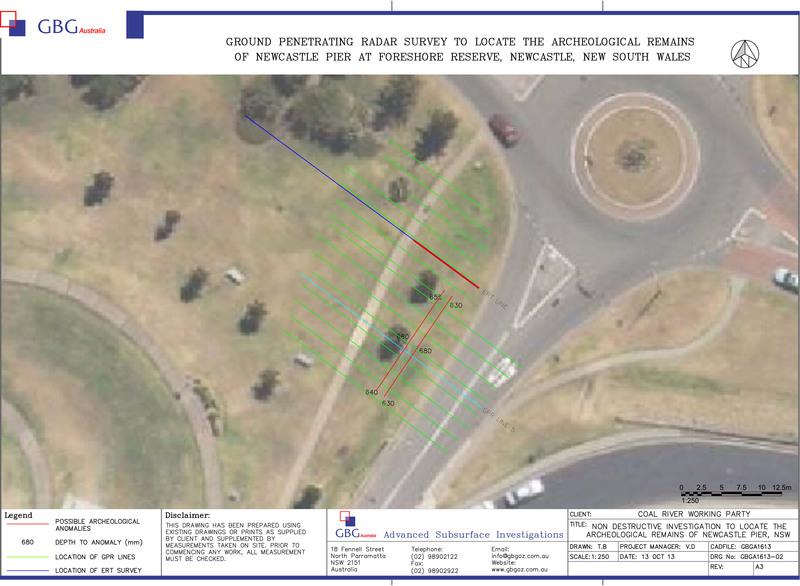 The target location for a possible archaeological test trench lies to the north of the trees on the foreshore park, along the red line which corresponds with the subsurface remains identified in the image at the top of the page. To this day the National Trust of Australia care for the tomb of Lachlan Macquarie in Scotland, as the “Father of Australia”, because it was during Macquarie’s period that Australia became officially the name of our country. We cannot forget his wife Elizabeth, who was by his side and inspired just as much nation building. So the University of Newcastle continues the quest for this buried testament to the “Father and Mother of Australia”. This Friday afternoon (25th October) from 3pm onwards researchers from the University of Newcastle and The City of Newcastle Council will meet on site with Tim Adams Senior Archaeologist, Umwelt (Australia) Pty Ltd and Kerrie Grant, archaeologist from RPS (Australia & Asic Pacific) to discuss a archaeological research design to take to the Heritage Branch. “I cant express our appreciation to these people and their firms who have come forward to assist us with this quest,” said Gionni Di Gravio, “Without their professional assistance we would have next to no hope of taking this project to the next phase of actually finding this thing” he said.